One.Two.Three, Exhibition view, WIELS, 2016. Photo credit : Sven Laurent. 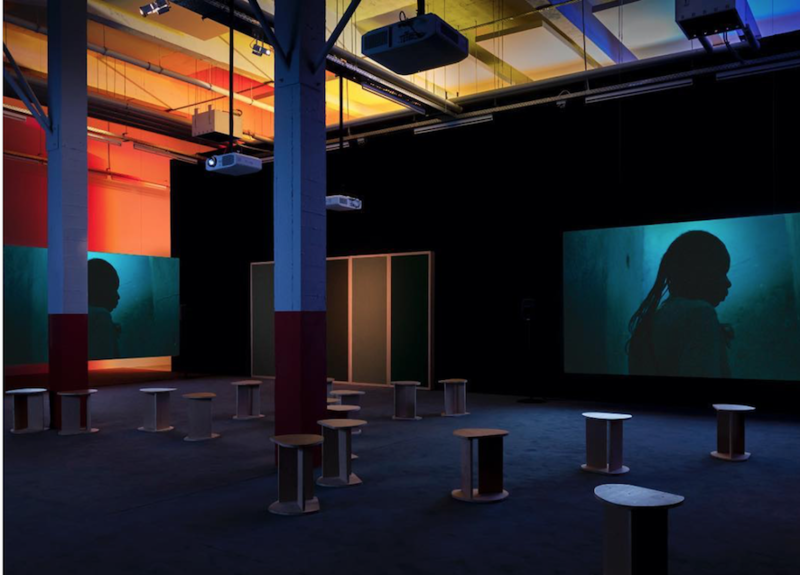 Audiovisual work by Vincent Meessen, created for the Belgian Pavilion at the 56th Venice Biennale (2015). ‘A ghost is haunting the world – the Situationist International’. It was with this allusion to the opening sentence of the Communist Manifesto that the Situationist International, the last international avant-garde movement of Western Modernity, provocatively inscribed itself into future history. The Situationist International has left an imprint as radical as it is indelible on the worlds of ideas and forms. It fundamentally changed the understanding of the relationship between art, politics and daily life, in its instrumental and decisive role during the events of May 68, and in its critique and detournement of forms of market spectacle. Reviled, art was its first target, and we know that ever since, artists have continued to debate and struggle with this critical heritage. In One.Two.Three, Vincent Meessen begins by circumventing the trap of Situationist mythology, in which Guy Debord has been consecrated as the hero and epicentre of a revolution. Instead, the work revisits a part of the history of this movement which has to date been ignored. The starting point for the work is the discovery, in the archives of the Belgian Situationist Raoul Vaneigem, of the lyrics to a protest song that Congolese Situationist Joseph M’Belolo Ya M’Piku composed in May 1968. 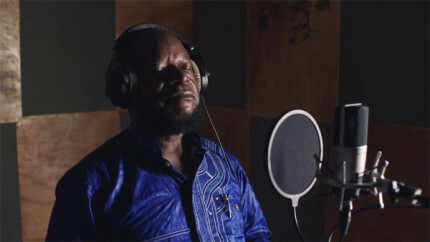 Working with M’Belolo and young musicians in Kinshasa, Vincent Meessen has produced a new rendition of the song. The fragmented cinematographic display of the work offers a spatial translation of this collective arrangement of subjectivities. The multi-coloured labyrinth of Un Deux Trois, the club that was once home to the world-famous OK Jazz orchestra led by Franco Luambo, a key figure of artistic modernity in the Congo, offers the perfect setting for a musical dérive. 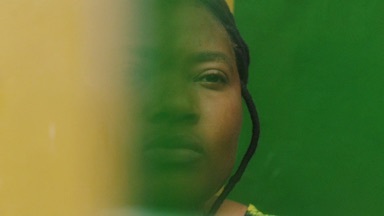 Against the background of Congolese rumba, a popular and hybrid genre par excellence, threatened vernacular architecture and revolutionary rhetorics of the past, the film puts to music the narrative of unexpected meetings and one of the forms that resulted from it: M’Belolo’s song. 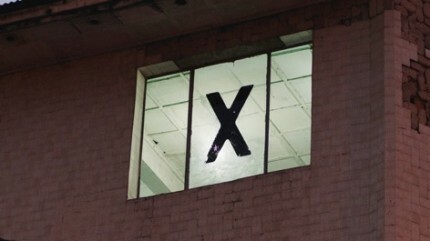 Transformed into an experimental space by musicians who, in the course of their perambulations, try to get attuned to each other, the club becomes an echo chamber for the impasses of history and the unfinished promises of revolutionary theory. 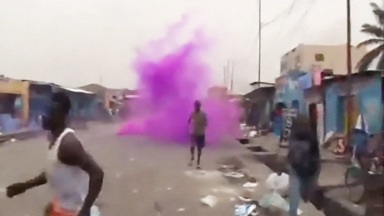 And while M’Belolo Ya M’Piku rediscovers the song he had lost, popular uprisings break out in Kinshasa just outside of the walls of the rumba club. In spite of the cycle of violence and the militarisation of everyday life, a space is created for play, polyphony and dance. The rendition that matters in One.Two.Three is perhaps less the recovery of the song than the rendition of emancipation itself, which, irresolute by nature, remains condemned to an ‘untimely repetition’. surround sound, acoustic panels, coloured textile, wooden frames, stools, carpet. One.Two.Three was originally part of the exhibition Personne et les autres, Vincent Meessen & guests, Belgian Pavilion of the 56th Venice Biennale, 2015.